John Force, his family and the NHRA will be the focus of an HBO special. Drag racing’s “first family” will be profiled on HBO’s Real Sports with Bryant Gumbel Tuesday night. 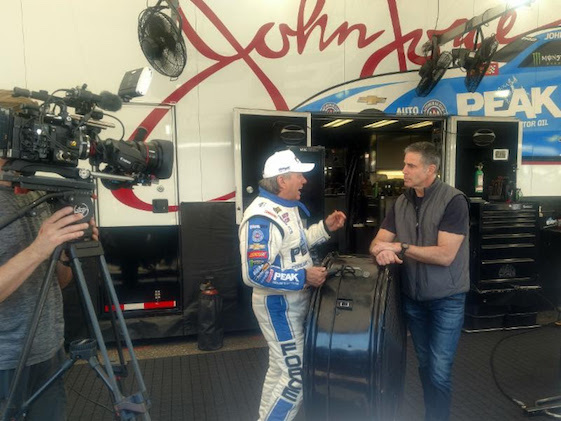 John Force Racing spent four days with the award-winning HBO sports journalism series over the course of two weeks. Led by 16-time NHRA Funny Car world champion John Force, the organization will be featured on the Emmy Award-winning program today at 10:30 p.m. (EDT). Journalist Jon Frankel conducted interviews with team members in their hometown of Yorba Linda, Calif., and at one the biggest events on the NHRA Mello Yello Drag Racing series schedule, the recent AMALIE Motor Oil NHRA Gatornationals at Gainesville (Fla.) Raceway. Frankel takes a detailed look at the family, their passion for racing and Force’s rags-to-riches story. In addition to “Brute” Force, JFR’s lineup includes two-time/reigning NHRA Funny Car world champion Robert Hight along with daughters Courtney and Brittany. Courtney drives a Funny Car for her dad’s team while Brittany is the reigning NHRA Top Fuel world champion. Real Sports is TV’s most-honored sports journalism series, with a record 31 Sports Emmy Awards, including 18 for Outstanding Sports Journalism. Now in its 23rd season, the monthly magazine TV show produces unchartered investigative pieces and in-depth profiles from across the sports spectrum. Agree, John. It should also be a (black) eye-opener for Gumbel and Frankel. My gosh, have they been living under a rock for the 20 years? Watched the JFR profile and actually learned a couple of things about John’s past…the stuff about his dad, hand-me-down clothes and shoes, etc. However, shook my head over two things. First,journalist Jon Frankel described drag racing thusly: “Yes, the goal is to see who can hit the top speed…without dying.” Big-time hyperbole and also wrong, in that drag races are decided by elapsed time, not speed. When the report was done, Frankel sat opposite host Bryant Gumbel…who admitted that until this report, he never had heard of John Force. And Frankel said neither had he. That should be a (black) eye-opener for NHRA’s marketing people.